The works will be subjected to double-blind peer review, with the reviewers being anonymous for the authors and the authors for the reviewers. The reviewers will be external and independent of the Journal and will be selected due to their academic, scientific and research experience in the subject matter of the article. 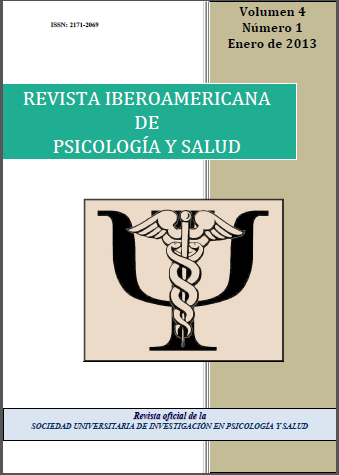 The Revista Iberoamericana de Psicología y Salud (The Psychology and Health Ibero-American Journal), as a member of the Committee on Publication Ethics (COPE), follows its recommendations. d) Unethical research. Editors assume the responsibility for everything they publish; promoting procedures and policies to ensure the quality of the published material and to maintain the integrity of the published record. It is an author’s obligation to non-acquire any agreement that permit research funders and sponsors a veto publication to warn editors of a relevant inaccuracy or error that had discovered in his/her published paper, as well as to cooperate for retracting or correcting the errors or inaccuracies detected by himself/herself, the editors, editorial board members or a third party. Authors are invited to adhere to journal requirements: the submitted manuscript is an original one, not previously been published elsewhere, and not currently being considered for publication elsewhere; authors have permission for publication all copyrighted material within the article. The key literature on the topic should be reviewed and referenced. Protection of Human Subjects and Animals in Research. When experiments which have been carried out on human beings are described, it is essential to indicate whether the procedures followed comply with the ethical standards of the human experimentation committee responsible (institutional or regional), and in accordance with the World Medical Association and the Declaration of Helsinki. When animal experiments are described, it is essential to indicate whether these have been carried out in accordance with the standards of an international research institution or council, or with a national law regulating the care and use of laboratory animals. Moreover, a written declaration to this effect must be included. Informed consent. The authors are responsible for following the protocols established by their respective health centers to access data from medical records in order to write this type of publication for research / disclosure purposes for the community, and thus must declare that they have complied with this requirement. The author is obliged to ensure that the requirement of having informed the patients enrolled in the study has been met and has possession of the document signed by them on having received sufficient information and having obtained their written informed consent for participation in the study. 3 In the Methods Section, the authors must mention that the procedures used on the patients and controls have been performed after obtaining Informed Consent or have a Certificate from the Institutional Ethics Committee stating that there is no need for Informed Consent. Privacy. The author is also responsible for ensuring the right of privacy of the patients, protecting their identity, both in the writing of their article and in the images. Names, initials or hospital case note numbers will not be used (or any other type of data irrelevant to the investigation that could identify the patient), neither in the text nor in photographs, unless that information is essential for scientific purposes, in which case it could appear in the article provided that the patient – or his/her parent or guardian, gave their written Informed Consent in writing. The authors are responsible for obtaining the written consent, authorizing their publication, reproduction and disclosure on paper support and free access on the Internet. Funding. The authors must declare any source of any financial help received. The authors must acknowledge if the research has received funding from the US National Institutes of Health or if any of the authors belong to the Howard Hughes Medical Institute. To have participated in the conception and design, the acquisition of data, analysis and interpretation of the data of the work that has resulted in the article in question. To have participated in writing the text and its possible revisions. To have approved the version that will finally be published. In the case of collective authorship, it will include the name of the writers or those responsible for the Instructions to Authors work followed by “and the …Group…” when all the members are considered as co-authors of the work. If it is desired to include the name of the group, although not all members may be considered as co-authors, the formula used will be to mention the authors responsible, followed by “on behalf of the … Group…”…or “for the … Group…”. In any event, the names and the institutions of the members of the group should be included in an Appendix at the end of the manuscript. The authors will be stated . Revista Iberomericana de Psicología y Salud does not accept any responsibility on possible conflicts arising from the authorship of works published in the Journal. Conflict of interests. There is a conflict of interests when the author/s has/have/ had financial or personal relationships that could have inappropriately biased or influenced their actions. Potential conflicts of interests exist regardless of whether or not the interested parties consider that these relationships influenced their scientific judgment. The authors must state any financial or personal relationships that they had or may have, at the time of writing or submitting the article, with persons or institutions and that could give rise to a conflict of interests as regards the article which is submitted for publication. What is declared will appear in the printed journal. Obtaining permissions. The authors are responsible for obtaining the appropriate permissions to partially reproduce material (text, tables or figures) of other publications. These permissions must request from the author, as well as from the Journal which published that material. Permission to publish is also required by the institution that financed the research. The authors must be aware that not to reveal that the material submitted for publication has been wholly or partially published is a severe breech of scientific ethics. Similarly, authors who reproduce previously published material in their article (text, tables or figures) are responsible for obtaining the appropriate permissions to reproduce that material in the journal. Redundant or duplicate publication. The journal does not accept previously published material and will not consider any manuscripts for publication that are simultaneously submitted to other journals, or redundant or duplicate publications, that is, articles that substantially overlap another article already published, printed or in electronic media. The authors must mention in the cover letter any previous submissions or publications of the same work, wholly or partially, which could be considered a redundant or duplicate publication. It is necessary to mention and include the literature references of these previous publications in the new manuscript. These restrictions do not apply to published abstracts of papers, presentations or conferences presented at national or international scientific meetings. All submissions are obliged to participate in peer review process. Manuscripts are typically sent to 2 reviewers (editors may get the support of additional reviewers). Reviewers should have no conflict of interest (e.g., regarding the research, the authors and/or the research funders). The responsibility of the reviewers is to be objective and assess the merits and weaknesses of the manuscripts. Reviewers should argue their evaluations. Reviewers should point out relevant published work that has not been cited by the authors and reviewed articles should be treated confidentially. Editors have complete responsibility and authority to reject/ accept an article based on the outcome of the peer review, and for the contents and overall quality of the publication. The editors will promote courses of action for correction or retraction when errors were found, and will control conflict of interest with respect to articles they reject/accept. If an editor was aware of a real or potential conflict of interest in relation to a handling of a submission, this editor will decline to participate in manuscript assessment and judgment making. The same procedure is also applied to papers submitted by one of the editors, by author(s) of the same institution than the editor or when any other condition related to a judgment bias (e.g., close friendship, co-authorship) was advertised. Under these contingencies, other editor will select referees and make all decisions on the papers. Editors will only accept a paper when they are reasonably certain. The journal and editors are obligated to preserve anonymity of reviewers. With the submission of the paper, the journal assumes that the authors certify that they were not involved in conflict of interest conducting the research. The journal may ask to disclose any actual or potential conflict of interest (see an application form at the page 235 of the Publication Manual of the APA). The statements, opinions and data contained in the papers published in the Revista Iberoamericana de Psicología y Salud are solely those of the individual authors and contributors and not of the publisher and the editors. The publisher and the editors disclaim responsibility for any injury to persons or property resulting from any ideas, methods, instructions or products referred in the contents of the papers. Authors submitting a manuscript do so with the understanding that if it is accepted for publication the copyright of the manuscript, including the reproduction of the paper in all forms and media, shall be transferred to the publisher. Creative Commons Acknowledgement-Non-commercial-No derivates (CC BY-NC-ND): with non-commercial purposes, allows others to distribute and copy the article, provided that it accredits the authorship(s) and that the article is not altered or modified. The works should be adjusted to the instructions described in the 6th edition of the Publication Manual of theAmerican Psychological Association (APA) (2010), as regards the references, tables, figures, abstract, format, narrative style, etc. Manuscripts not adjusted to the APA style will not be considered for publication. Title, abstract and 5 keywords in the original language of the article (Spanish or Portuguese) and in English. If the article is originally written in English, the second language will be Spanish. The abstract will contain between 150 and 200 words. Full names of all the authors, their affiliations, and e-mail addresses. Complete manuscript with double spacing, and a maximum length of 7,000 words, including references and tables. At the end of the document it will include the literature references (according to the style of the APA, 6th edition) and if there are any, the tables –in an editable format and numbered consecutively according to the order mentioned in the text – each one with its own title and figure legends. Figures (photographs, graphs, drawings and schemes) will be presented in separate documents and numbered consecutively according to the order mentioned in the manuscript. The photographs should always be presented with the maximum possible resolution and in jpg or tiff format.